This is a DIY robotics project where you will learn how to make a robot arm. The robot arm is controlled by Arduino, Computer Software, Servos, and Mechanical Parts. This is a must for anyone wanting to know how to build robots, interested in robotics, or an advanced electronics project. The servo mount bracket is made from a sheet of 2mm aluminium (I sourced a 500mm x 500mm sheet from elfa.se in Sweden, however you should be able to get similar sizes from your local hardware store). Since you will need 5 of these brackets it is a good idea to build a template and a jig to help making them easier and more consistent. All of the parts of the robot arm are made using very similar techniques so, for this first bracket, I will show as much detail as possible for the construction. To make the template I used a 60mm x 1000mm x 4mm aluminium bar which was cut using a mitre-saw to ensure it has a square edge. The bracket template is then printed out and cut to size using a sharp hobby knife and a metal ruler. Once prepared you then dot-punch the template at each of the marked punch points. This makes it a lot easier to drill the template accurately as without the dot-punch marks the drill tip will slip on the surface of the aluminium. The idea of the template is to allow you to both drill through and dot-punch through (for the fold-lines) so you need to make sure that the drill-size is wide-enough for your dot-punch to go through without being too wide and making the template inaccurate. I used a 2.5mm drill bit. Now that you have the jig and template you simply have to cut a piece of 2mm thick aluminium to size (I used a combination of the mitre saw, jigsaw and file to do this). Place the aluminium in the jig with the template on top and start by dot-punching the markers and fold-lines shown on the template. After that use a bench drill to drill the guide holes for the rest of the bracket. Now take the aluminium out of the jig and drill the guide holes to the correct size as shown in the CAD drawing. When drilling thin aluminium you will find that the underside of the drill holes can burr quite a lot. To remove the unwanted burring you can either use a de-burring bit or you can use a drill-bit which is much larger than the original hole (for example an 8-10 mm drill bit for the 3 mm holes). Line up the fold-line and then place a piece of wood over the bracket. Fold it back by pressing on the wood. This helps to keep the pressure even over the bracket and bend it without warping the shape. You can use the edges of the wood to bend back the smaller parts in a similar manner. The turntable base is then attached to four pieces of aluminium cut from a 40mm x 1000mm x 2.5mm bar. Again the dimensions and drill pattern is included in the CAD drawings. To begin assembling the arm mechanism start by bolting all the servos in place using M3 screws and nuts. As the arm requires a lot of torque to deal with the weight of the arm I used metal gear high-torque servos. The lower 5 servos (turntable, shoulder (x2) elbow and wrist) are SAVÖX SC-0252MG servos which produce 10.5kg/cm of torque at 6 Volts. The wrist-rotate servo is a Fubata S3003 standard servos which produce about 3.5kg/cm. All of the servos (except the wrist rotate) are metal-gear and dual-metal bearing to ensure that they are physically strong since the arm will place a lot of pressure on them. Once mounted in the servo brackets the servos are then connected to the C brackets. On one side the servo head is mounted using the cross shaped servo head provided with the servo. These are cut to size and then screwed/bolted in place. On the other side of the bracket a flanged bearing is fitted to the 8mm hole which is then bolted through the bracket using an M3 screw and a nylon nut to prevent the rotation from unscrewing the nut (note that the flange of the bearing is on the outside of the C bracket). If the M3 screw is a little long you can use 2-3 M3 washers on the outside of the bracket to make sure it does not dig into the back of the servo.The bearings have an inner diameter of 4mm, and outer diameter of 8mm and are 3mm thick. The bearings are flanged meaning that they have a small metal lip on one side which prevents them from being pushed through the bracket. This type of bearing is quite common in remote control car models and can be purchased either from a model shop or from sites such as Ebay. There are 4 bearings in all, 3 in the arm and one in the end-effector (see below). Once you have mounted the servo brackets to the C brackets it is a simple case of bolting together C brackets (as shown in the picture below) and the smaller L brackets to form the arm itself. The L brackets fit under the servo brackets and are secured using four M3 screws and nuts. The end-effector design is based around two counter rotating gears which use levers to make the grippers open and close laterally rather than using a pincer-action. This allows the design to use relatively small parts but still achieve a open aperture of about 65mm to allow the arm to pick up quite wide objects. The biggest issue I found when making the effector was the gears. It is quite hard to find suitable gears which are easily sourced and not too large. In the end I decided to use 20mm Lego Technics gears which can be found easily in any toy store. The first step is to drill two 3mm holes on either side of the Lego part. The gears I used had two handily placed mold markings which I dot-punched (very lightly!) and then drilled. Once the part is drilled you will need to file down either side of the gear to make it flush with the outer hub of the gear. To do this simply rub the gear up and down on a flat-file (I found this was easier as gripping the gear in a vice is likely to damage the teeth as the Lego plastic is quite soft). Once the part is filed flat you can then use some small side cutters to remove the inner hub of the part. This has to be removed to allow the gear to be mounted to the end-effector in a later step). Next, to mount the Lego gear to the servo and the second gear mount, you will need to drill two servo heads to fit the Lego parts. These are later bolted to the Lego part as you assemble the end-effector. Now you can attach the end-effector to the arm. Don't forget to screw it in place to the wrist-rotate servo. The bracket is raised just enough so you can get a screw driver into the servo head. To keep the electronics as simple as possible to build I designed the control circuit based on an Arduino UNO. The UNO board has an ATmega328 AVR microcontroller with built-in USB. This allows you to build a fully USB capable device without the hassle of soldering surface-mount components. Since I wanted to supply 6Vs to the servos (to get the maximum torque) the custom 'shield' simply supplies Vin to the servos. The issue with hobby servos (especially high torque servos) is that, under load, the current consumption can be pretty high. Most tests performed on the web conclude that the peak draw is around 400mA per servo. Allowing for a little head-room (i.e. 500mA per servo) and the fact we have 6 servos, the power supply needs to be rated at over 3 Amps in order to do the job. I sourced a regulated 6-15V PSU from a local electronics store which can supply 5 Amps at 6 Volts, more than enough for the job. This supply is directly connected to the UNO power connector. It's a good idea to pick a PSU with both overload and short protection, as this will help save your electronics if (when) you make a mistake. To make the shield as generic as possible I placed 7 servo output connectors on the board (one for each PWM output on the UNO). This means that you could use the shield design for any project requiring 1 to 7 servos. The schematic for the servo control shield is attached in project files. I used 7 servos compatible board because my plan is to use it with full humanoid Robot (under construction). All files were attached in project files. Open the Simulink model of the robot arm. The controller consists of four PID controllers (one per joint). Each PID controller is implemented using the "2-DOF PID Controller" block from the Simulink library (see PID Tuning for Setpoint Tracking vs. Disturbance Rejection example for motivation). Typically, such multi-loop controllers are tuned sequentially by tuning one PID loop at a time and cycling through the loops until the overall behavior is satisfactory. This process can be time consuming and is not guaranteed to converge to the best overall tuning. Alternatively, you can use systune or looptune to jointly tune all four PID loops subject to system-level requirements such as response time and minimum cross-coupling. In this example, the arm must move to a particular configuration in about 1 second with smooth angular motion at each joint. The arm starts in a fully extended vertical position with all joint angles at zero. The end configuration is specified by the angular positions: Turntable = 60 deg, Bicep = -10 deg, Forearm = 60 deg, Wrist = 90 deg. The angular trajectories for the original PID settings are shown below. Clearly the response is too sluggish and the forearm is wobbling. The robot arm dynamics are nonlinear. To understand whether the arm can be controlled with one set of PID gains, linearize the plant at various points (snapshot times) along the trajectory of interest. Here "plant" refers to the dynamics between the control signals (outputs of PID blocks) and the measurement signals (output of "Robot Arm" block). SnapshotTimes = 0:1:5; % Plant is from PID outputs to Robot Arm outputs LinIOs = [... linio('rct_robotarm/Controller/TurntablePID',1,'openinput'),... linio('rct_robotarm/Controller/BicepPID',1,'openinput'),... linio('rct_robotarm/Controller/ForearmPID',1,'openinput'),... linio('rct_robotarm/Controller/WristPID',1,'openinput'),... linio('rct_robotarm/Robot Arm',1,'output')]; LinOpt = linearizeOptions('SampleTime',0); % seek continuous-time model G = linearize('rct_robotarm',LinIOs,SnapshotTimes,LinOpt); size(G) 6x1 array of state-space models. Each model has 4 outputs, 4 inputs, and between 0 and 13 states. While the dynamics vary significantly at low and high frequency, the variation drops to less than 10% near 10 rad/s, which is roughly the desired control bandwidth. Small plant variations near the target gain crossover frequency suggest that we can control the arm with a single set of PID gains and need not resort to gain scheduling. With looptune, you can directly tune all four PID loops to achieve the desired response time with minimal loop interaction and adequate MIMO stability margins. The controller is tuned in continuous time and automatically discretized when writing the PID gains back to Simulink. Use the slTuner interface to specify which blocks must be tuned and to locate the plant/controller boundary. In its simplest use, looptune only needs to know the target control bandwidth, which should be at least twice the reciprocal of the desired response time. Here the desired response time is 1 second so try a target bandwidth of 5 rad/s (bearing in mind that the plant dynamics vary least near 10 rad/s). wc = 5; % target gain crossover frequency Controls = TunedBlocks; % actuator commands Measurements = 'Robot Arm'; % joint angle measurements ST1 = looptune(ST0,Controls,Measurements,wc); Final: Peak gain = 1, Iterations = 50 Achieved target gain value TargetGain=1. The four curves settling near y=1 represent the step responses of each joint, and the curves settling near y=0 represent the cross-coupling terms. The tuned controller is a clear improvement but should ideally settle faster with less overshoot. The 2-DOF PID controllers have a feedforward and a feedback component. The responses look good except for the Bicep joint whose response is somewhat sluggish and jerky. It is tempting to blame this discrepancy on nonlinear effects, but this is in fact due to cross-coupling effects between the Forearm and Bicep joints. To see this, plot the step response of these two joints for the actual step changes occurring during the maneuver (-10 deg for the Bicep joint and 60 deg for the Forearm joint). When brought to scale, the first row of plots show that a 60-degree step change in Forearm position has a sizeable and lasting impact on the Bicep position. This explains the sluggish Bicep response observed when simultaneously moving all four joints. To improve the Bicep response for this specific arm maneuver, we must keep the cross-couplings effects small relative to the final angular displacements in each joint. To do this, scale the cross-coupling terms in the tracking requirement by the reference angle amplitudes. To prevent jerky transients and avoid overloading the motors, limit the control bandwidth by imposing -20 dB/decade roll-off past 20 rad/s. Finally, explicitly limit the overshoot to 5% and increase the desired phase margin from its default value of 45 degrees to 60 degrees. Compare the scaled responses with the previous design. Notice the significant reduction of the coupling between Forearm/Wrist and Bicep motion, both in peak value and total energy. The simulation results appear in Figure 6. The Bicep response is now on par with the other joints in terms of settling time and smooth transient. Verify: Compiles and approves your code. It will catch errors in syntax (like missing semicolons or parentheses). Upload: Sends your code to the 101 board. Serial Monitor: This will open a window that displays any serial information your 101 board is transmitting. It is very useful for debugging. Board and Serial Port: Shows you what board and the serial port selections. 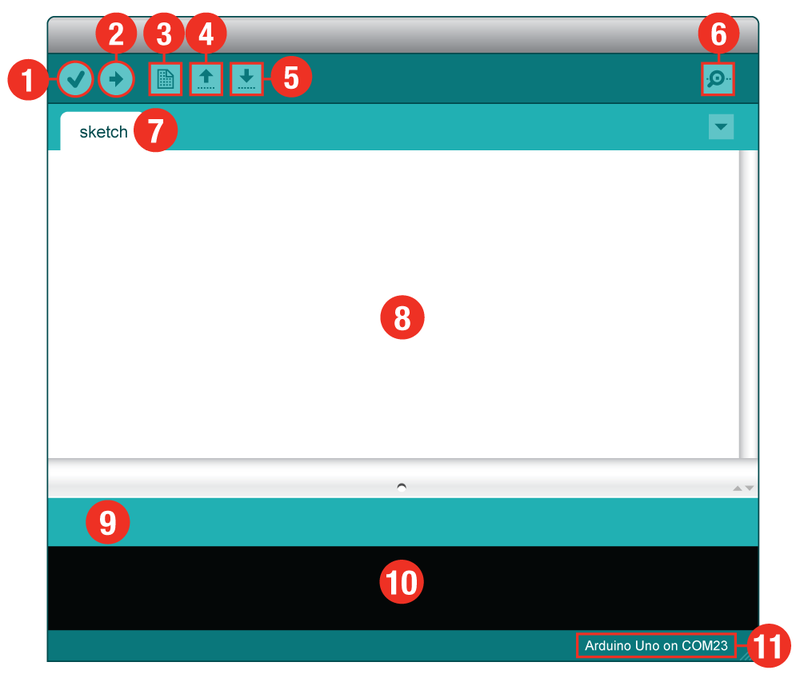 Know download the code from project files and then upload it to Arduino UNO (Atmega328). 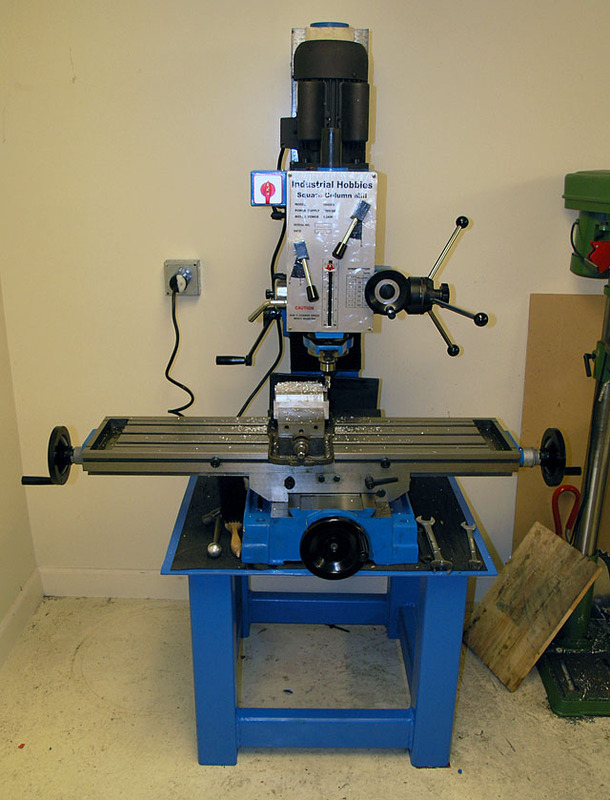 A lathe is an example of a machine tool. A machine tool is a machine for shaping or machining metal or other rigid materials, usually by cutting, boring, grinding, shearing, or other forms of deformation. Machine tools employ some sort of tool that does the cutting or shaping. You need a lab setup for proper electronics designing but as this project is not so big so you need some place for soldering purpose.